This is a dangerous game for Gonzaga. Florida State unceremoniously knocked off No. 1 seed Xavier in the round of 32. The Seminoles swarmed the Musketeers on the defensive end — forcing 18 turnovers. Xavier’s normally prolific offense failed to garner any traction, due in large part to Florida State’s commitment defensively. Gonzaga certainly is at a disadvantage as it pertains to depth. Florida State has at least nine players (sometimes 10) playing extended minutes. As for the Bulldogs, head coach Mark Few really only plays seven. This could be problematic in the later stages of the game — particularly since Florida State does have an athleticism advantage across the board. However, there are plenty of reasons for optimism for the Spokane-based program. Few is a superior coach to Leonard Hamilton. The team as a whole also brings more collective experience when compared to Florida State. Gonzaga is only a year removed from a National Championship Game appearance. Any sort of adversity faced in this contest will not bother the Bulldogs. Statistically, Gonzaga is a better team both offensively and defensively. The Zags rank No. 3 nationally in offensive efficiency and No. 14 in defensive efficiency. The frontcourt trio of Killian Tillie, Johnathan Williams, and Rui Hachimura is as good as you’ll find in the country. Duly, veteran guards Josh Perkins and Silas Melson are flanked by rising star freshman Zach Norvell Jr. The Chicago native dropped a team-high 28 points in last week’s win over Ohio State. Gonzaga should be able to get one step closer towards yet another Final Four appearance. Its pedigree — coupled with its efficiency — will be too much for Florida State to handle. It’s arguably a more well-rounded (and talented) team than the one that lost in last year’s title game to North Carolina. We’ve got a complete contrast in styles for this contest. Michigan is a perimeter-oriented team. Much of John Beilein’s success has come from instituting an offensive scheme rooted in moving the basketball. The Wolverines will backdoor-cut the opposition to death if adjustments aren’t made. On the other side, Texas A&M’s strength relies solely with its big men. Robert Williams is virtually a human pogo-stick. He gobbles up rebounds at a high clip, blocks shots with reckless abandon, and can truly alter the opposition’s offensive chances with jaw-dropping athleticism. Tyler Davis is fantastically crafty round the rim, and 6’9″ D.J. Hogg represents a major match-up problem for most teams. 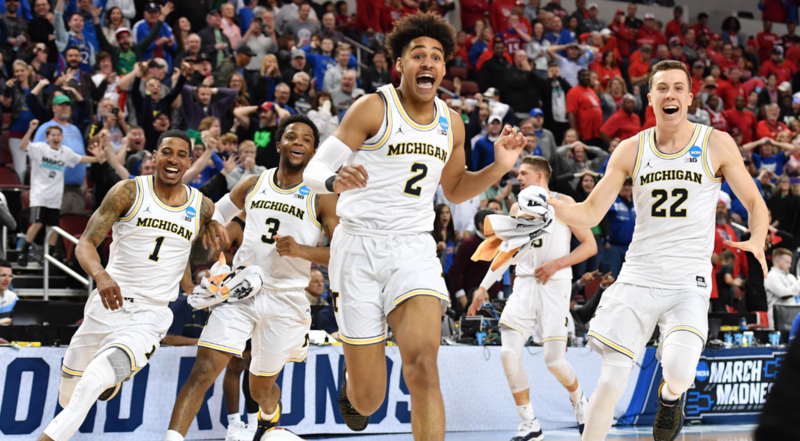 Michigan needed a last-second shot from Jordan Poole to get past Houston. The Aggies shocked everyone by absolutely obliterating No. 2 North Carolina by 21 points. The trio of Hogg, Davis, and Williams combined for 30 rebounds, six blocks, and 40 points. Texas A&M was able to impose its will on North Carolina. Guards T.J. Starks and Admon Gilder were also fantastic from the perimeter (scored a combined 33 points). In fact, Texas A&M shot a blistering 10-of-24 from three-point range en route to the easy victory. Texas A&M isn’t your average No. 7 seed. Prior to the season starting, this team had Final Four aspirations (and talent). The Aggies are undoubtedly a dominant team in the paint. When Billy Kennedy’s team is also knocking down threes with regularity, they’re very tough to beat. This game will be very close — largely due to Beilein’s coaching ability. Moe Wagner will need to be more assertive offensively than he was against Houston (only nine shot attempts). Look for Michigan to try and drag A&M out of the paint with tons of motion. Duly, one could also envision plenty of pick-and-roll situations which could lead to some mismatches between Texas A&M big men and Michigan guards. In the end, Texas A&M’s powerful frontcourt will be the difference.